Potassium Sorbate & Sodium Benzoate are two common preservatives added to store bought salsas. Our bodies are not deficient of Potassium Sorbate & Sodium Bensoate. Since the only purpose for these preservatives are to allow more time to package, ship and keep it on the shelves, we should be encouraging our local stores and farmers markets to provide us with freshly made salsa and other preservative free condiments. I use to live near a supermarket that made their own salsa- sans the preservatives and sold it at a great price. It was absolutely fabulous! 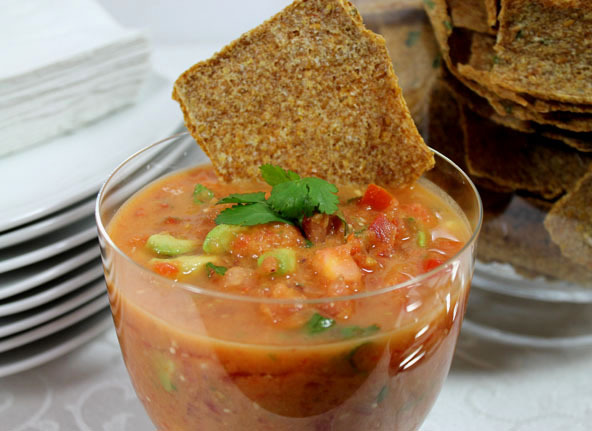 The ingredients in salsa are so good for us and can be used with so many dishes. It should be a staple in our homes. Let’s be more pro-active and communicative with the store buyers as to what we would like. Me might be surprised at the changes we could see. Meanwhile, if you can’t find preservative-free salsa in your local market, here is a great recipe that has served me well. Dice 3 of the tomatoes and set aside. Dice the green onion and bell pepper and set aside. Blend all the rest of the ingredients in the blender just enough to blend mixture but not puree. Stir in the diced tomatoes, onion, red bell pepper and tomatillo/jalapeno. Keeps in the refrigerator for 3 days.